At Jonesboro Alignment we can find the battery you need to get where you need to go! Come in and talk with our experts and see how we can help. Come to our shop today to see how we can fully service your tires and get you set up for smooth driving! For quality alignment, professional tire repair and installation, as well as brake service. We are a family-owned business delivering honest and professional automotive repair and auto maintenance services to the people of Jonesboro and surrounding areas. The quality ASE (Automotive Service Excellence) certified technicians at Jonesboro Alignment Service employ today’s latest automotive technology and are equipped to handle all major and minor repairs on foreign and domestic vehicles. 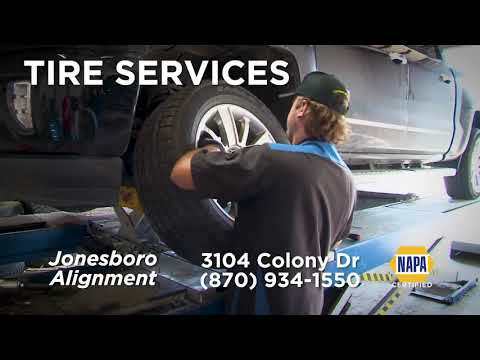 Jonesboro Alignment Service has been providing quality car care in Jonesboro for years. Our shop’s dedicated technicians use the latest technology. Our auto repair shops is conveniently located in Jonesboro. Our certified mechanics are equipped to handle all repairs. The team at Jonesboro Alignment Service is not only knowledgeable--they are friendly as well. If you have a question about a service we perform on your vehicle or want advice on how to better take care of it, we will help you. Jonesboro Alignment Service has the best team in town. The team is also aided in their repair work by the latest technology in the automotive repair business. You can be assured we only use the best equipment in our work.